Enjoy a fun filled week of Dance!! Meet new friends and try new styles of dance along with exciting arts & crafts. End the week with a special performance with the Philly Phanatic at the Phillies vs Dodgers Game at Citizen's Bank Park on Monday July 15th! The Phillies Dance Camp will take place Monday, July 8th - Friday, July 12th from 9am-3pm. Extended care is available from 3-5pm. Camp includes a full day of dancing with classes in Jazz, Hip Hop, Gymnastics, Lyrical, Arts & Crafts, and Dance Choreography. 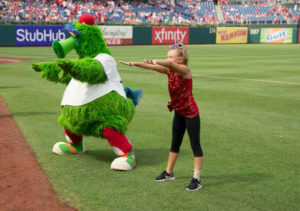 Ending the week with a Performance with the Philly Phanatic at Citizen's Bank Park on Sunday, July 15th for the 7:05pm game, Phillies vs Dodgers. Snacks will be provided each day of the camp; however, dancers must provide their own bagged lunch. Costumes for our performance at the game will be provided by the studio. Dancers will provide their own white tee shirt. During camp, we will create tees to wear to the game. This camp is offered to children ages 7-13 (no dance experience necessary). The cost for the camp is $325.00 per child ($300 if paid before 5/1/19). The cost for extended care (3pm-5pm) is $20 per day. Phillies tickets are available for parents, family and friends (pricing and more information will be available in July). To register, please complete both sides of the Registration Form and return or mail to the studio along with your full payment. Please submit one form per student. No student will be permitted to participate in the camp without a signed registration form and waiver. Contact us if you have any questions. DO NOT WAIT TO REGISTER!!! Availability of Summer Programs will be determined per enrollment. Waiting until the last minute to register could cause a program to be canceled!!! PLEASE REGISTER BY MAY 1, 2019 to receive a special discount & reserve your spot! Officially Opening August 13th 2016, the Angela Bates Dance Academy is thrilled to offer quality dance training for children, teens and adults. Dance lessons are life lessons! All classes are conducted in a positive environment while passing on the passion for the art of dance. ABDA offers a wide variety of classes including Ballet, Tap, Jazz, Lyrical, Contemporary, Hip Hop, Street Jazz and more.